As I mentioned on Friday, it's easy to overlook vegetable sides when putting together a Thanksgiving meal that already consists of turkey, stuffing, mashed potatoes, gravy, and cranberry sauce. But they are a welcome complement to those protein- and carb-rich dishes. That's not to suggest that every vegetable side has to be virtuously "healthy." 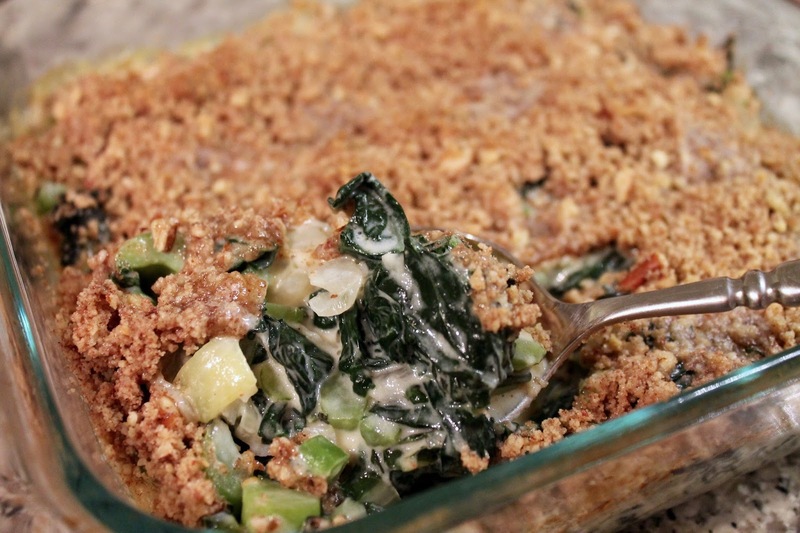 Enter the gratin: a hot, bubbly, creamy irresistibly cheesy vegetable side. Gratins are easy and popular. They are often topped with cheese or bread crumbs, although for this one, I used a topping of finely chopped pecans, which go nicely with the smoky gouda cheese melted into the sauce. 2. Cut the stems from the kale leaves. Chop the leaves into 2-inch wide pieces. Dice the stems. 3. Bring a large saucepan with two quarts of salted water to boil. Cook the kale leaves in the boiling water until tender, about 3 to 4 minutes. Remove from water and set aside to cool. Squeeze leaves to remove excess moisture and set aside in a large bowl. 4. Heat olive oil in a large sauté pan over medium heat. Add the diced kale stems, onion, and garlic, season with salt and pepper and sauté until softened, about 8-10 minutes. Transfer onion mixture to the bowl with the kale leaves. 5. Return the sauté pan to medium heat. Add 1 tbsp. butter and, when melted, add the flour and whisk to combine. Cook, whisking constantly, until lightly browned, about a minute or two. Add the milk, mustard and nutmeg, whisk to combine and cook until the mixture bubbles and thickens. Reduce heat to medium-low and add the shredded cheese. Whisk until the cheese is melted and the sauce is smooth. 6. Pour cheese sauce over cooked vegetables in the large bowl and stir to combine. Transfer to a buttered 9 x 9 baking dish. 7. Pulse pecans in a food processor until ground into crumbs. Spread in an even layer on top of the kale mixture. Cut the remaining tbsp. of butter into small cubes and scatter across the top of the pecan topping. 8. Bake the gratin until the mixture bubbles, about 15 to 20 minutes. Remove from oven and allow to cool a bit before serving warm.